The original Mini measured just over three metres, an original Range Rover nudged 4.5 metres. 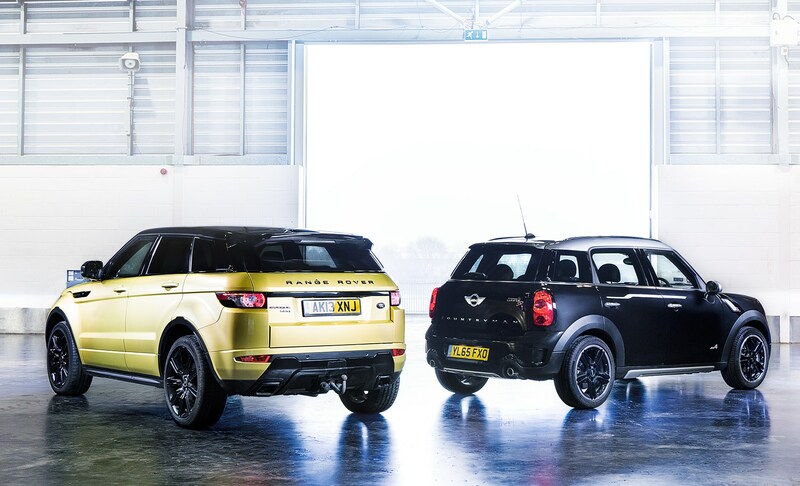 Today, just 26cm separates Mini’s largest, the Countryman, from Land Rover’s smallest, the Evoque. But the price gulf remains: the cheapest Countryman costs £17,125, the cheapest Evoque £30,600. Only a used Evoque gets price parity. 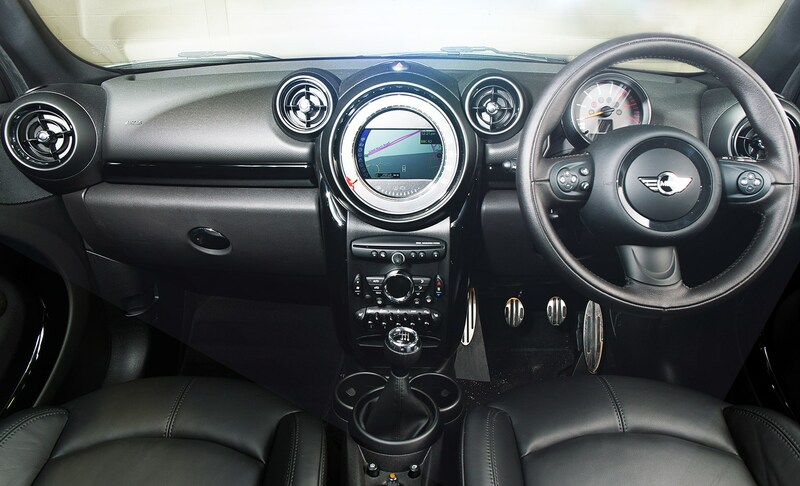 A whisker under £24k, our new Mini Countryman Cooper SD ALL4 sits towards the top of the range. The Evoque was launched in 2011, and today the cheapest are £17k. Talking yourself up to £24k bags a 2012 entry-level Pure with 40-50k miles, the most powerful SD4 diesel all-wheel-drive auto , and the popular Tech Pack from a franchised dealer. We’re driving a high-spec Evoque SD4 Dynamic. A five-door might not pack quite the visual punch of a three-door ‘coupe’, but the meaty Dynamic bodykit, 20-inch alloys, citrus-fruits paintjob, contrast roof and gloss-black trim means it still looks like a concept car. And the advantage of the practical body is rear seats that are easy to access, and in which four six-footers can happily co-habit. From the driver’s seat, the interior exudes calm confidence. The almost supercar-like rake of the windscreen contrasts with the opposing slant of the uncluttered centre console. The controls are neatly organised, the materials quality, and the double stitching and trim inserts that pick up the exterior hue are nice details. This car wears its 23,000 miles very lightly. The diesel’s not the quietest chugger at idle and it’s gravelly when extended, but mostly you sit in the refined mid-range, whooshed along by the flexible torque and six-speed auto’s quick, smooth shifts. Never frustratingly slow, never impressively fast, this is performance that does the job perfectly well. 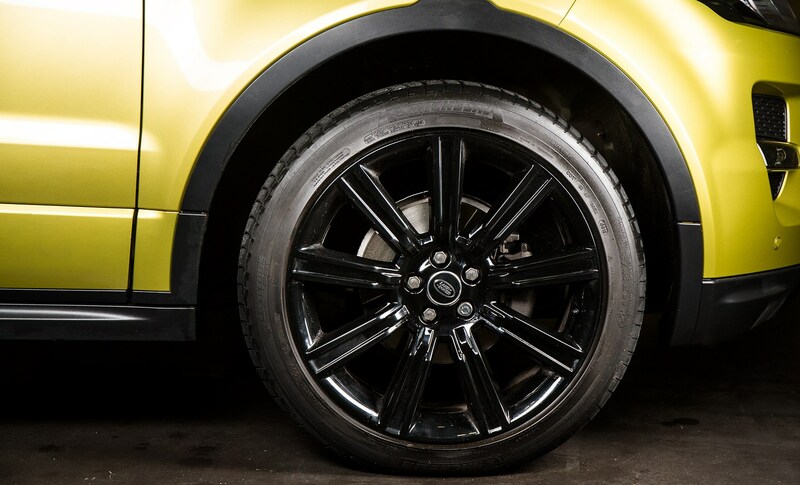 All-wheel drive removes any scrabble from the front tyres, and thanks to Adaptive Dynamics dampers, this Evoque rides with a fluid poise. Dynamic mode removes the suspension and dips the steering rack in quicksand, leaving the responsively light helm a distant memory. The Mini might be the new car here, but the ageing Countryman was actually introduced before the Evoque. It looks noticeably smaller than its rival, the bulbous styling less covetable, but the Mini DNA has survived the transition to SUV. So too have the interior trademarks, with quirky toggle switches, a huge central speedo framed by air vents that risks a Disney lawsuit, and a handbrake you’d swear Scotty once used to go warp-speed. Impressively, while the boot might be smaller than the Evoque’s, there’s surprisingly little in it for rear-seat passengers. But there’s no doubt it’s more cluttered and upright in here, and while the materials generally impress, the plastic air vent shrouds betray penny pinching. Immediately you notice the Mini’s extra road-, engine- and exterior noise. The body control also feels sloppier, and surface intrusions kick their way up the steering column more readily. This is not a bad car to drive: the steering is quick and pointy, and the 141bhp diesel four doesn’t feel any slower than the Evoque’s 187bhp – our Evoque is 215kg heftier. And in the wet, all-wheel-drive works wonders. It’s just a shame that the go-kart feel has been lost in the stretch upwards and outwards. So Evoque wins the road test. Can Mini claw back some pride with running costs…? Mini offers TLC and TLC XL service packs. TLC covers all servicing costs for five years or 50,000 miles for £399. £275 more upgrades to eight years/80k. The packages are transferrable. 98% of buyers opt for a TLC pack. Over five years, Mini calculates the average owner saves £399 if the car is kept for the duration and main-dealer servicing is used, based on £798 for all work required. For TLC XL, savings rise by a further £306. All diesel Evoques are subject to annual/16k service intervals, whichever’s first. Typical Land Rover dealership prices alternate between £207 and £283 – the fuel filter is changed at 32k intervals, in addition to oil, oil filter, air filter, washer fluid and pollen filter requirements every 16k. Exceptions come at 108 months/144k (£448) and 120 months/160k (£368), with auto transmission fluid, PTU fluid, rear differential oil, accessory drive belt and cambelt requiring replacement. 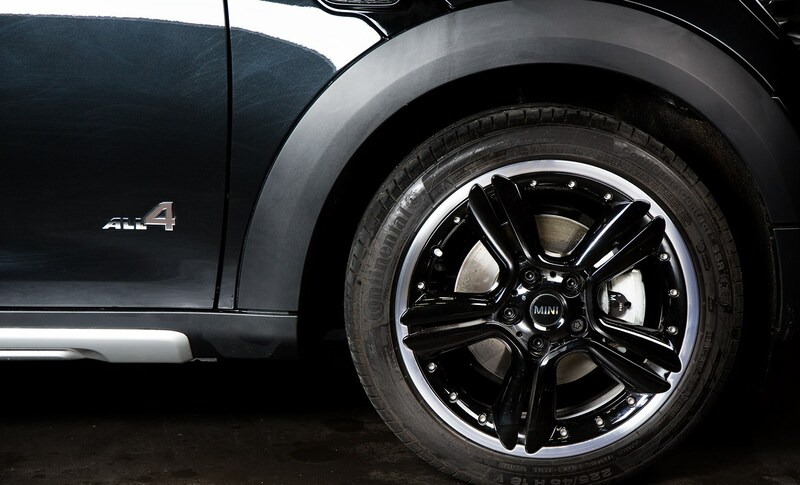 The Countryman is covered by Mini’s three-year warranty. Or extend that cover with three levels of cover: Comprehensive, Named Component and Driveline. A 10-plate Countryman with 40k miles would cost £427.67 annually with £100 excess. Visit miniwarranty.co.uk. Diesel Countrymans built between August 2010 and March 2013 were subject to a recall due to moisture entering the electric power-steering system, which could in rare cases lead to a fire. Check your car got the remedial work. A search of dft.gov.uk for vehicle recalls gave launch-2014 Evoques the all-clear. Better still, Land Rover specialists Nene Overland (01733 380687) say Evoques have proved reliable. Other than routine maintenance, the only fault they’ve seen relates to EGR valves. They range from £515 to £638 (the latter for genuine or OEM quality parts) fitted. Mostly you’ll be looking at consumables, which aren’t prohibitive. Brake discs, for instance, cost £46-£87 (front) or £51-£72 (rear). Pads stretch from £85-£95 (front), or £75 (rear). Mini Cooper options include auto gearbox (£1135), and all paint except white (£275-£480); 16in five-star alloys are standard, with everything from £130 16in upgrades to £2250 19s available (the latter bundled with run-flats and adaptive dampers for £200 extra). There are chromed mirrors (£65), bonnet stripes (£95), leather (£1250-£1520), and you can choose piano black (£175), dark silver (£280) or black chequered (£345) interior trim. The Media Pack (£1800) brings voice control, enhanced Bluetooth and USB, and Mini Connected smartphone connectivity. The Pepper Pack (£1140) includes onboard computer, LED foglights and white indicators, leather steering wheel; Chili Pack (£2595) adds upgraded alloys, sports steering wheel, cloth/leather interior, front sports seats, sport button, rain-sensing wipers/auto headlights, dark silver trim and more. 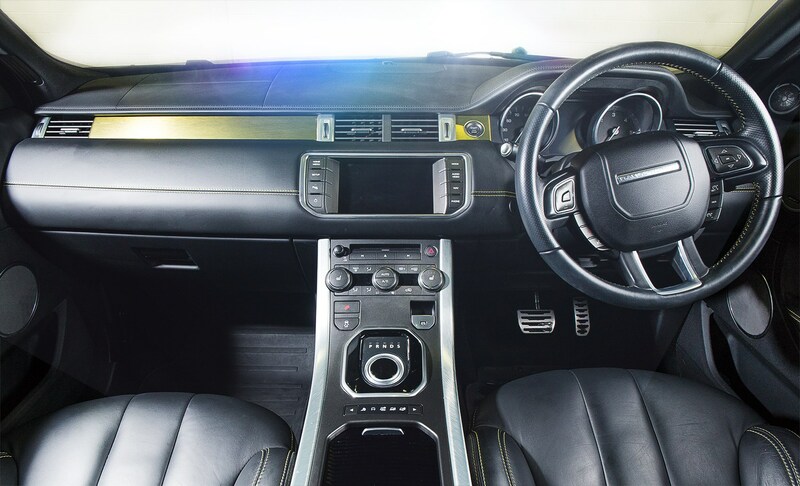 Evoques come in Pure, Prestige and Dynamic trim. Pure includes cruise control, 18in alloys, manual leather seats, multi-function steering wheel, rear parking sensors and an 8in touchscreen. A Tech Pack (£1900) could be specified for nav, auto-wipers and lights, heated screen and front parking sensors. Prestige upgrades to 19in alloys, Xenon headlights with LEDs, electric leather seats, reversing camera, HDD navigation and rain-sensing wipers. Dynamic adds more aggressive bodykit, Adaptive Dynamics (including adaptive dampers and Dynamic mode), and Dynamic leather seats. Both Prestige and Lux could be optioned with the £4325 Lux pack: power tailgate, fixed panoramic roof, 825w Meridian audio, dual-view touchscreen, surround camera, blind-spot monitoring and keyless entry. Other popular options include Adaptive Dynamics (£1150), metallic paint (£445-£995), contrast roof (£500), privacy glass (£350), 18-20in alloys (£225-£1250) and heated steering wheel (£180). Only if you’re budgeting for the cheapest £17k Countryman would we recommend the peace-of-mind of an all-new car. At that price, your Evoque will be out of warranty and showing more miles than a U2 tour bus. But stepping up to low- to mid-20s gets a nicely spec’d Pure – even a Prestige – 2012 Evoque with choice options, FSH, as little as 40k miles, plus the security of a two-year warranty from a franchised forecourt. The Evoque not only wins the design war inside and out, it’s also more spacious, more refined and better to drive too. And because both cars are compact SUVs with four-cylinder turbodiesels, the frequent pitfalls of our used winners – namely typically higher running costs – aren’t a concern in this instance. 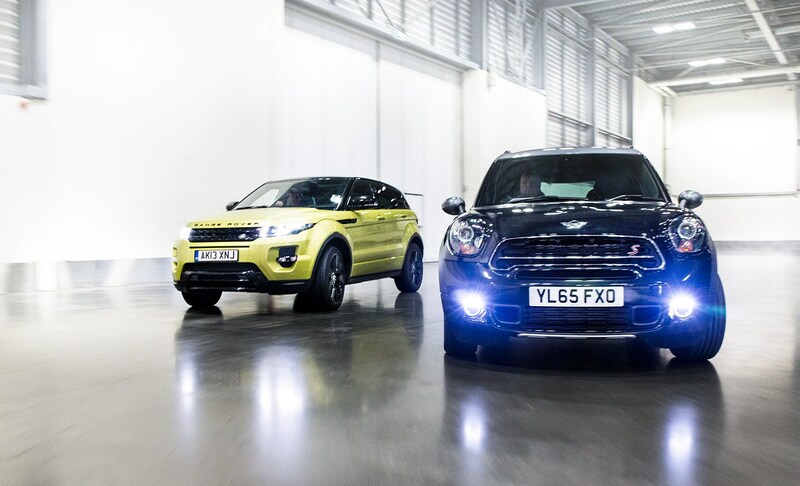 Case closed; Evoque wins. ‘I’ve owned my SD4 Pure Evoque coupe for two years, it’s done 35,000 miles and I’m pretty satisfied so far. The higher driving position is superb, and the rear visibility isn’t as bad as some think – the rear parking sensors re-assure nervous parkers. I love the interior, including the touchscreen infotainment – despite questionable alternate sat-nav routes in traffic – and I’ve never driven a smoother, more comfortable car. It’s even spacious in the back, if a squeeze to get there!